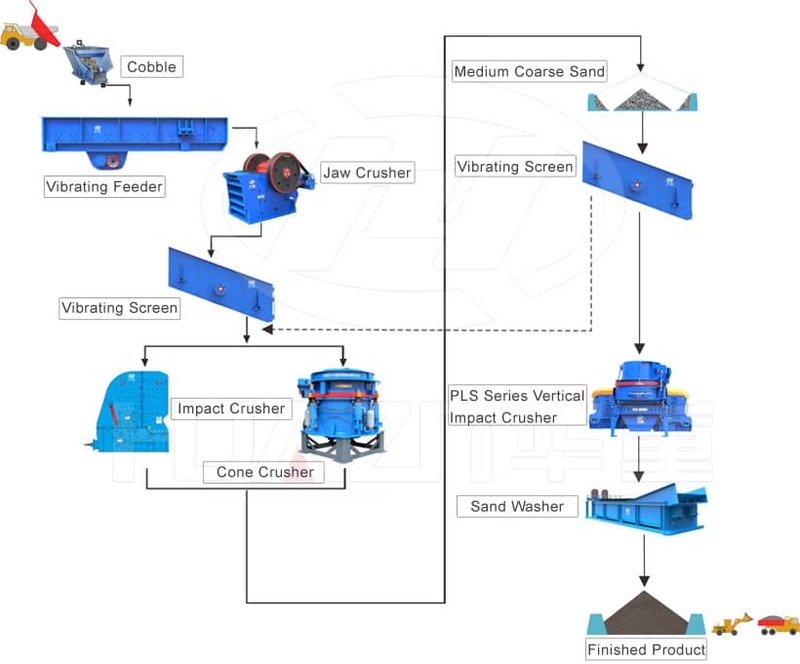 Cobble processing contains three procedures, coarse crushing of jaw crusher, medium and fine crushing of impact or cone crusher, and shaping stages of sand making machine. The lump cobble will evenly go through the vibrating feeder and transport to jaw crusher for coarse crushing. After the separation by the vibrating feeder the crushed material then will be transported to the impact crusher or cone crusher by the belt conveyor for medium or fine crushing. The crushed cobble will be sent to the sand-making machine for further crushing and re-shaping. If the clean cobble is needed, then it could be sent to the sand washing machine for cleaning. Customer Evaluations: By on site research and comparison with other equipment suppliers, Dahua’s equipment could meet our demands on performance and production capacity. Dahua’s product is quite advance among this industry. The engineer from Dahua gave us the detail configuration information based on feasibility and money saving. We are quite satisfied about the output and the shape granularity of the final product. Customer Evaluations: Dahua’s production line has feasible configuration and compact structure. They provide us the best solution based on our working sites and economy situation. The production line was installed by their engineers, who provide us instructions and personal training as well. The product’s output and shape meet our requirements. No machine break down of this production line, hence, we are quite satisfied with this production line.